With all the delays of the past couple of days, we were both getting a bit discouraged by our lack of progress and apprehensive about what might happen next. Our big goal has always been to get further south where it gets warm, but we just haven’t been able to make the miles we’d expected. We’d planned to be much further along, but we made a big push today – from Aberdeen, MD to Burlington, NC – 384 miles. Today’s big note was cold. 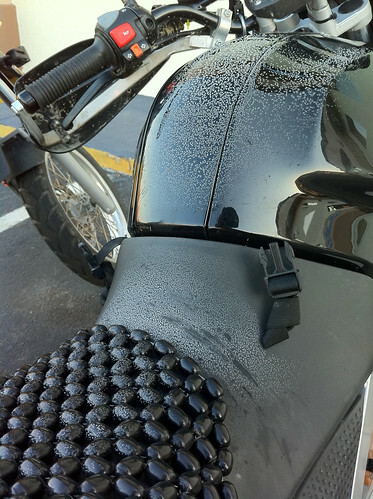 It was 17 degrees when we started loading up the bikes, and they were covered in frost. Horse didn’t want to start – took a little extra throttle – and both bikes were a bit demanding until they warmed up. We felt the same way. We ran into traffic fairly steadily from just north of Baltimore until we got south of Washington, D.C., so it took us 2.5 hours to get south of D.C. By then, I really needed a bathroom break and decided it would make the most sense to combine with lunch to avoid excessive down time. We got off I-95 at Woodbridge, and when we spotted a Denny’s, we both jumped on it. Kay ordered 6 eggs sunny side up, bacon, toast and hot tea, and I contented myself with an American slam and coffee. Neither of us felt particularly hungry when we stopped, but as soon as we went inside, we started shivering. We didn’t realize how cold we were until we got off the bikes and went into a warm building. We lingered over lunch with warm drinks for nearly an hour, until we got our core body temperatures up. Sadly, when we hit I-85 and turned further inland, the temperature started dropping dramatically. As we made our way west across North Carolina, it got colder and colder. We started seeing snow left over from a storm they had over the weekend, and our spirits dropped with the return of the cold. By 3PM, we were riding on sheer will alone – neither of us felt like being on the bikes in the cold anymore but we both wanted to get more miles under our belts. By the time we arrived at the hotel where we’re staying in Burlington, we were chilled to the core. We took a few minutes to take things off the bike and then straight into a hot shower, when we discovered that Kay’s Aerostich Kanetsu heated vest had left red burn marks in his back. We first saw the marks at least 10 minutes after turning off the heated gear, and two hours later, the marks have faded somewhat but are still burned into Kay’s back. Today’s lesson? Don’t buy the Aerostich Kanetsu heated vest. And we’ve discovered that we can do a long day even in the cold, but even being a few degrees warmer makes a dramatic difference. Sounds like an ambitious trip, Just wanted to say good luck and be safe out there. Buy extra O rings for your Optimus stove while you’re in US, they WILL break and you can never have enough O rings. Buy at least 20 in all sizes and take them with you. I don’t see spare tires on your bikes, you know that tires are out of this world expensive down here, don’t ya? Take two rear tires with you and buy new ones in Colombia. (the cheapest). a typical tire for your bike in Ushuaia will cost you $400 IF you can find it. Thanks for the heads-up, Chris! How much use did your Optimus stove get that caused you to go through that many O rings? It’s a good tip but we’re reluctant to add more things to the bikes as they’re already quite heavy and we’re looking for things to cut – not add. Re: tires – again we’re reluctant to carry the weight so we’ve been looking at our options. I’m getting new tires before we leave the US and Kay’s tires have a few thousand miles on them. If we need to, we can have someone here ship tires to us (we’re pondering the same thing for chains, although we are carrying sprockets). Columbia would probably be a good point for us to change tires, though, so thanks for the tip!